October is one of the months where our kids will have lots of sweet treats to eat. From treats we make at home to treats they get at school, plus the candy they will receive when they're out trick or treating, keeping their teeth healthy and bacteria free is important. 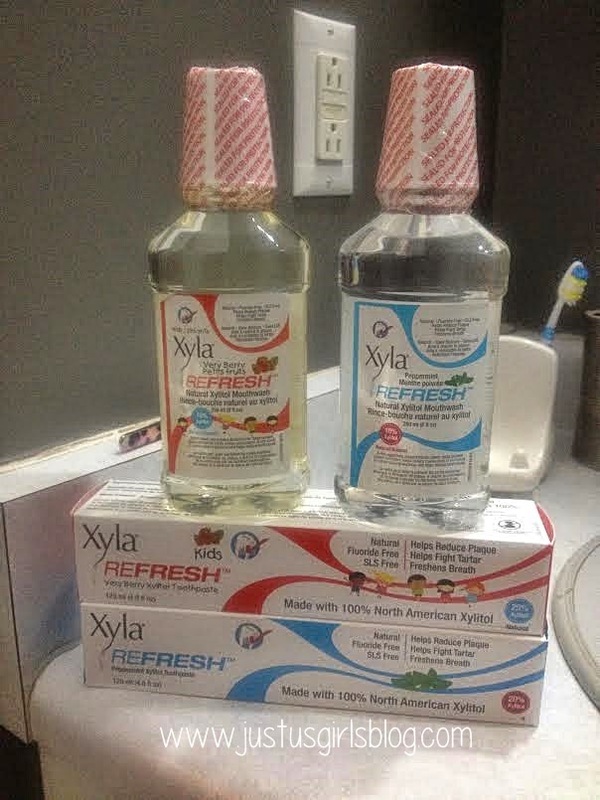 I was really excited when I received a package from Xyla Canada that included not only toothpaste and mouthwash for my hubby and me, but also toothpaste and mouthwash specifically for the kids. Xylitol has been used in the dental field for over 60 years to help promote oral health and the prevention of disease caused by bacteria. The toothpaste and mouthwash also helps protect your teeth from tartar, reduces the plaque and freshens your breath. We received the Refresh Peppermint Toothpaste for adults along with the Refresh Peppermint Mouthwash and both my husband and I have been very impressed. I love that both mouthwash and toothpaste weren't too minty and they have left my mouth feeling clean and protected. My kids got to try the Refresh Very Berry Toothpaste and Mouthwash and are happy using both. They're not fans of minty mouthwash or toothpaste, so having the Berry flavored toothpaste and mouthwash was a big hit and they loved it. We've been using both toothpaste and mouthwash all throughout the month of October and I love knowing that with all the sweets we've been eating lately, our teeth are being protected. The mouthwash and toothpaste for kids are both perfect for your kiddos to use this month, especially after Halloween when they'll be eating their Trick-OR-Treat candy. Disclosure: All opinions are my own. I received samples of Xyla Toothpaste and Mouthwash at no cost for the purpose of this review. No other compensation was received.